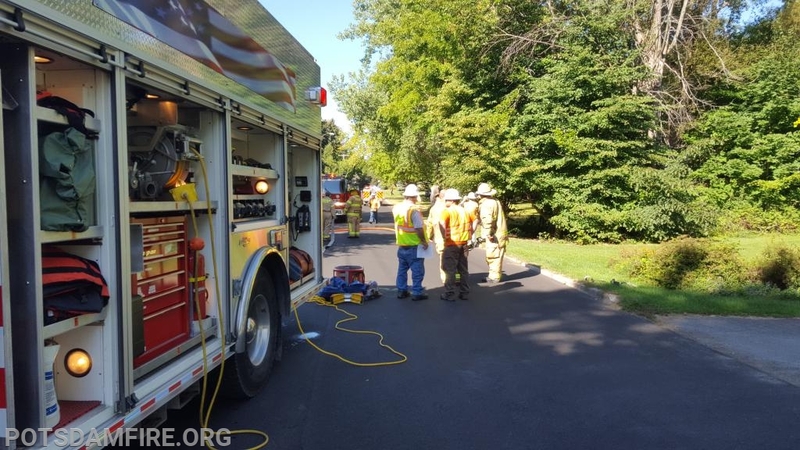 On Saturday September 15th St Lawrence County District 3 firefighters participated in a simulated Gas Emergency in conjunction with St. Lawrence Gas. District 3 is comprised of Potsdam, West Potsdam, West Stockholm, Hannawa Falls and Potsdam Rescue. At 9:15 am firefighters assembled in the front circle of the Potsdam High School on Leroy St. A briefing was given and the scenario is as follows. 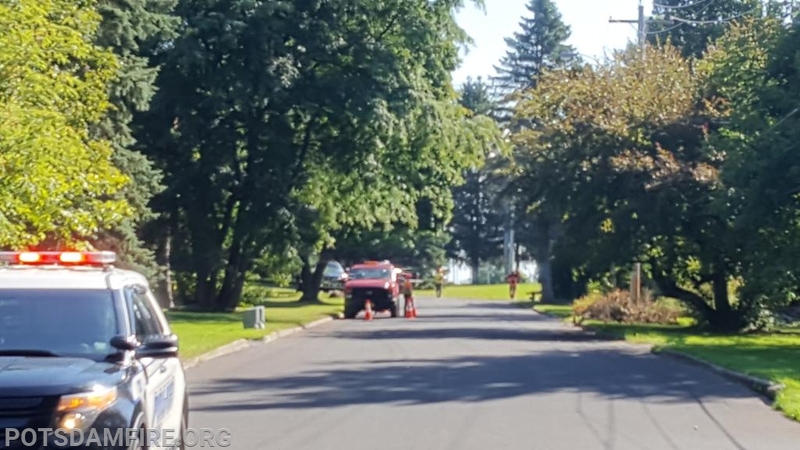 A contractor working on a sewer line on Castle Drive struck a gas line with an excavator. 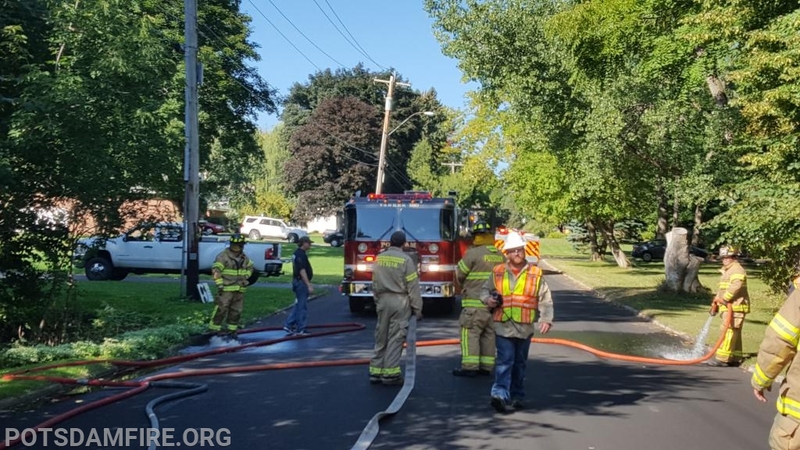 Gas from the ruptured line was free flowing and migrating into the sewer system. A mobile air compressor from the Village of Potsdam was used to simulate the sound of flowing gas. 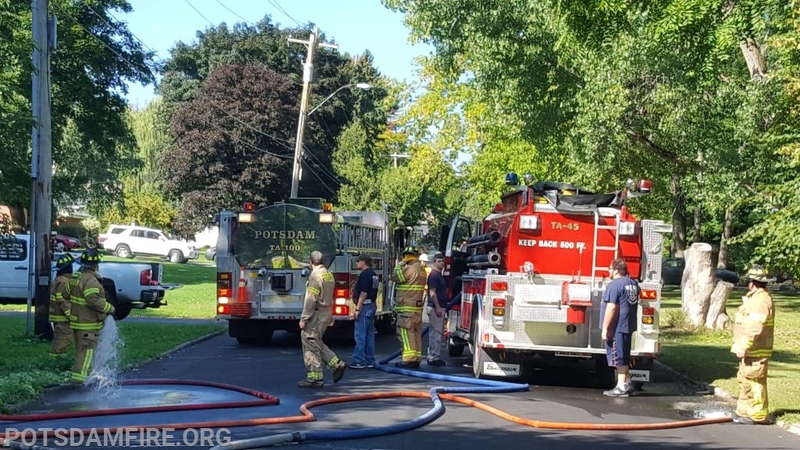 Potsdam PD was the first to respond and they quickly notified Potsdam Fire. Engine 49 responded along with along with 36-3 M Bradish and 36-4 J Bradish. Engine 49 stopped short of the leak and blocked off Castle Drive. 36-3 established Potsdam command and 36-4 took over Operations. St Lawrence Gas was notified and responded to the scene. 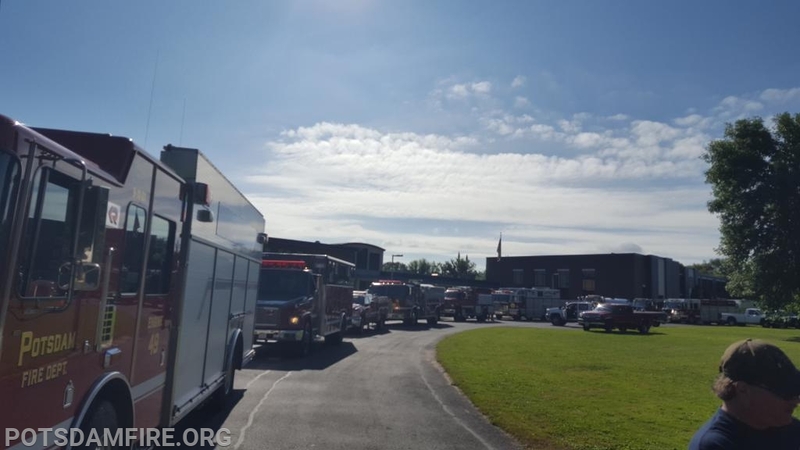 Even though mutual aid units were staged at the High School, units delayed responding immediately to simulate actual response times. 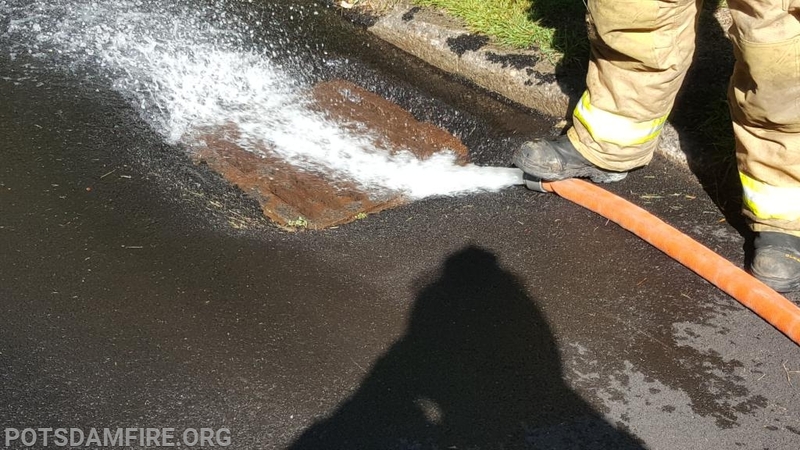 Engine 49 set up and started flowing water into the drains to flush the gas out. 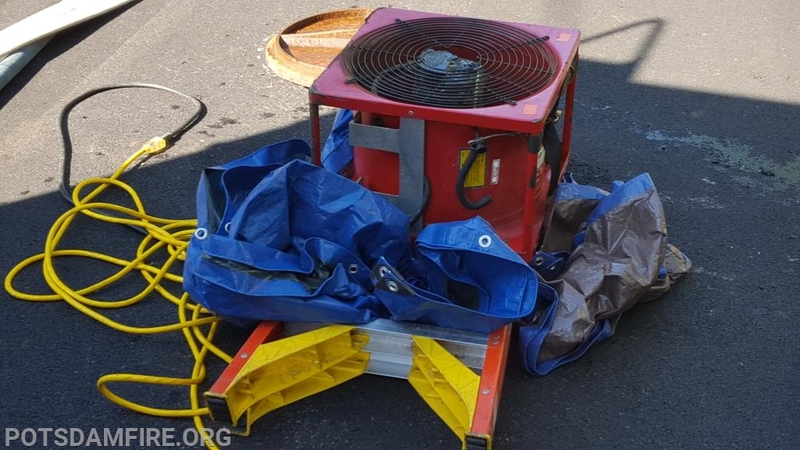 Manholes were opened and fans were used to draw the gas out of the sewers and dissipate it into the atmosphere. As mutual aid departments arrived they were assigned task of establishing a perimeter, evacuation of residents (simulated) assisting St Lawrence gas personal with opening additional manholes, addition fans to remove gas. As the drill progressed St Lawrence Gas advised the simulated leak had been controlled. Operations continued until leak monitoring showed all gas had dissipated. At the conclusion of the drill all involved agencies returned to Potsdam Station for a critique. 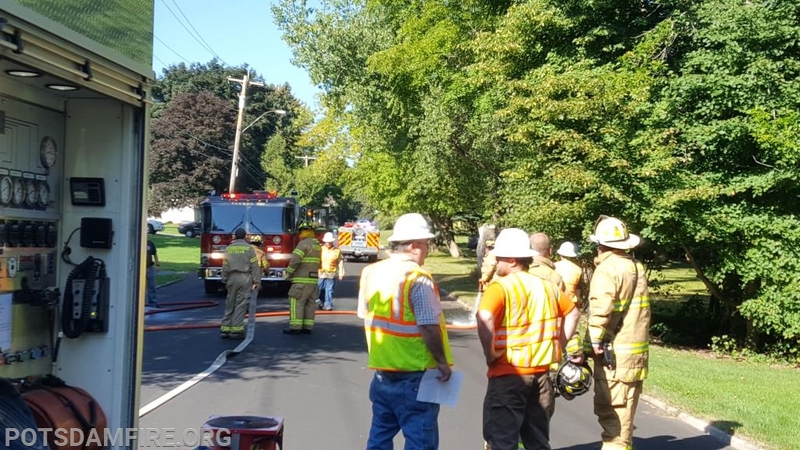 Agencies participating in the drill were; St Lawrence Gas, Village of Potsdam D.P.W., Potsdam PD, Potsdam Fire, Potsdam Rescue, West Potsdam Fire, West Stockholm Fire, Hannawa Falls Fire, Canton Fire, St Lawrence County Office of Emergency Services and Parishville Fire on standby at Potsdam Station. Looks like awesome work by all. Great write-up and pics!